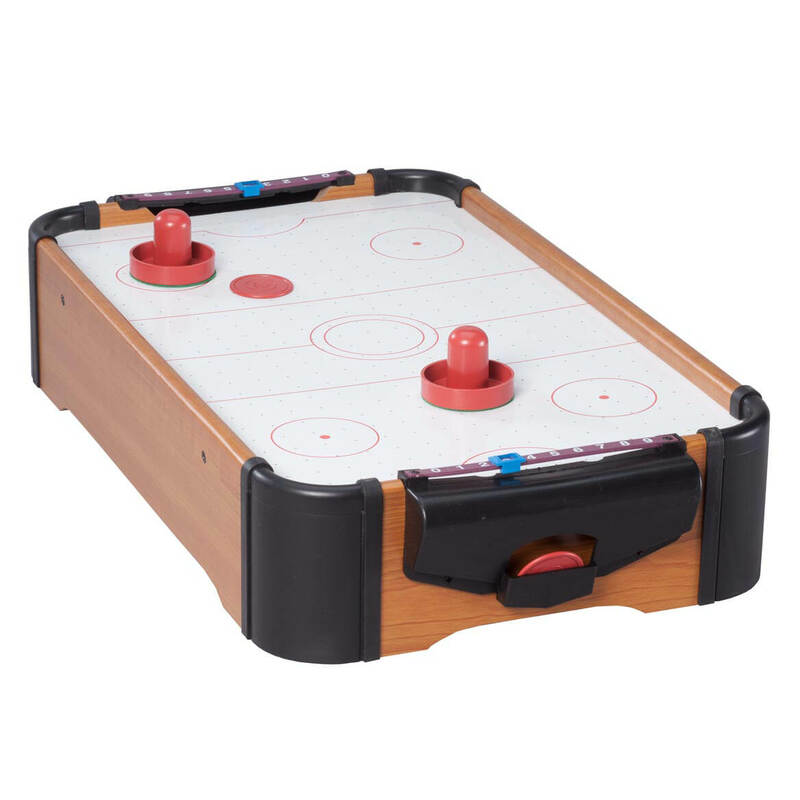 An old favorite around arcades, this tabletop air-hockey unit uses a cushion of air to make the pucks light and cause them to maneuver around as though they were on ice. 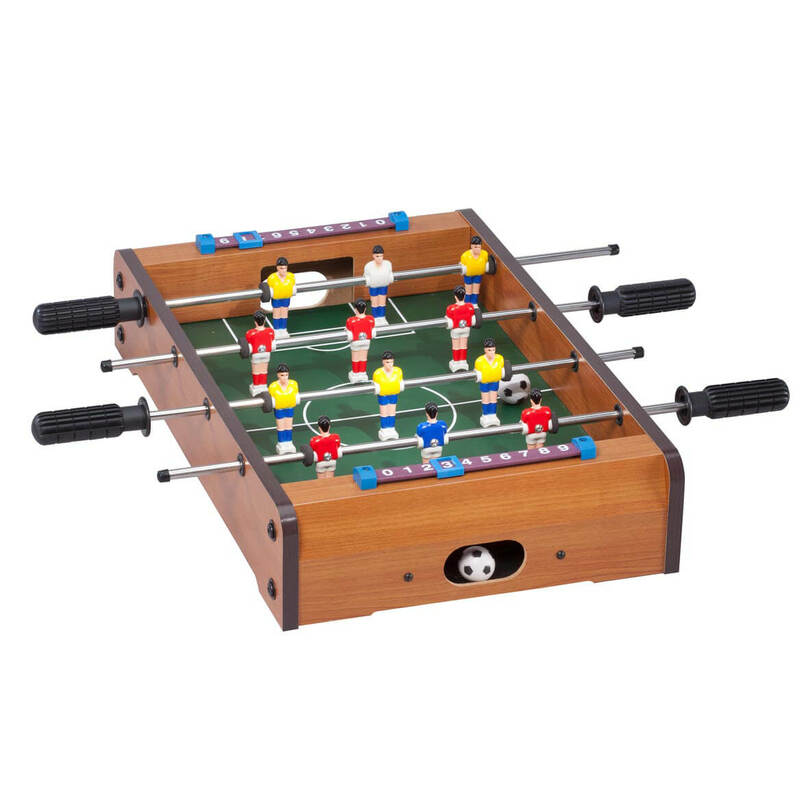 Table Top Air Hockey is just the right size for home as it is big enough to be challenging but small enough to tuck away under a bed or in a cupboard when not in use. Measures Approximately 20″ x 12 1/4″ x 4 1/4″. Requires 3 C batteries (not included). After rocking your favorite tunes on this flexible Rock and Roll It Piano Studio, simply roll it up for compact storage or indoor/outdoor portability—powering on its rechargeable battery or USB (cord included). The soft, space-saving roll up piano by MukikiM features 61 standard size keys, allowing you to play like a pro without taking up all the space of a large piano or keyboard. Its multi-function design features 128 keyboard tones, 128 rhythms, 45 demo songs, digital display and tempo control key. This roll up keyboard also features drum sound function, record & playback, OOP recording, teaching mode, vibrato/sustain, built-in speaker with volume control and auxiliary capabilities (headphones or external speaker) and audio output. And, it’s MIDI compatible, so you can record your music into your own computer! Power saving mode activates when not in use. 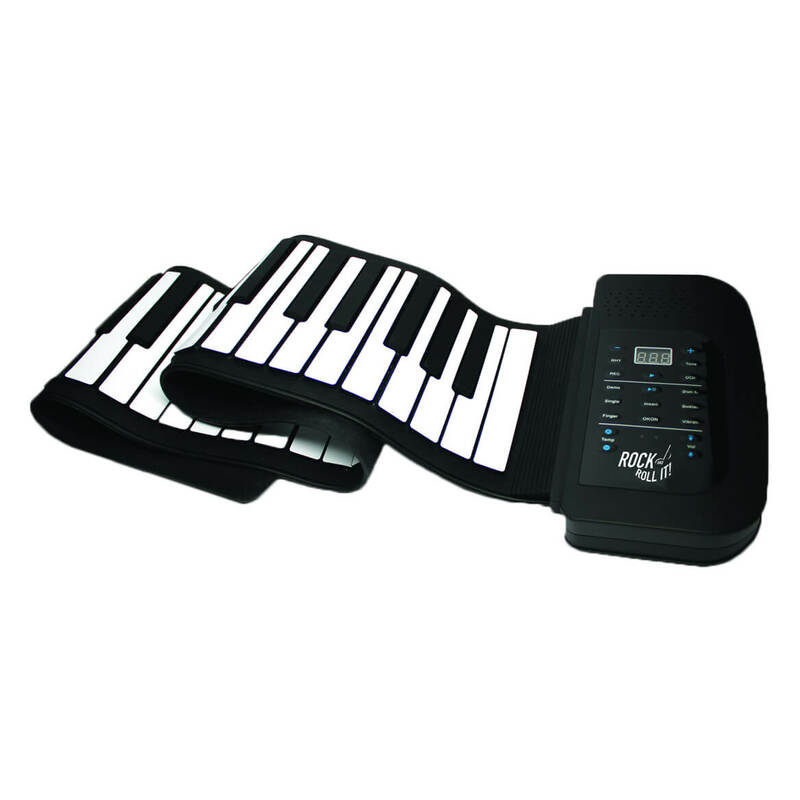 Digital piano includes user manual, 1 lithium rechargeable battery and 47″ USB power cord (wall plug not included). 36″ x 6 1/2″ x 1/4″ piano rolls up to fit 4 1/2″ x 8 1/2″ x 1 1/4″ box. It’s perfect for any and every pianist—from beginner to master, kids to adults! Silicone, plastic. Allow 2-3 weeks for delivery. No express shipping. 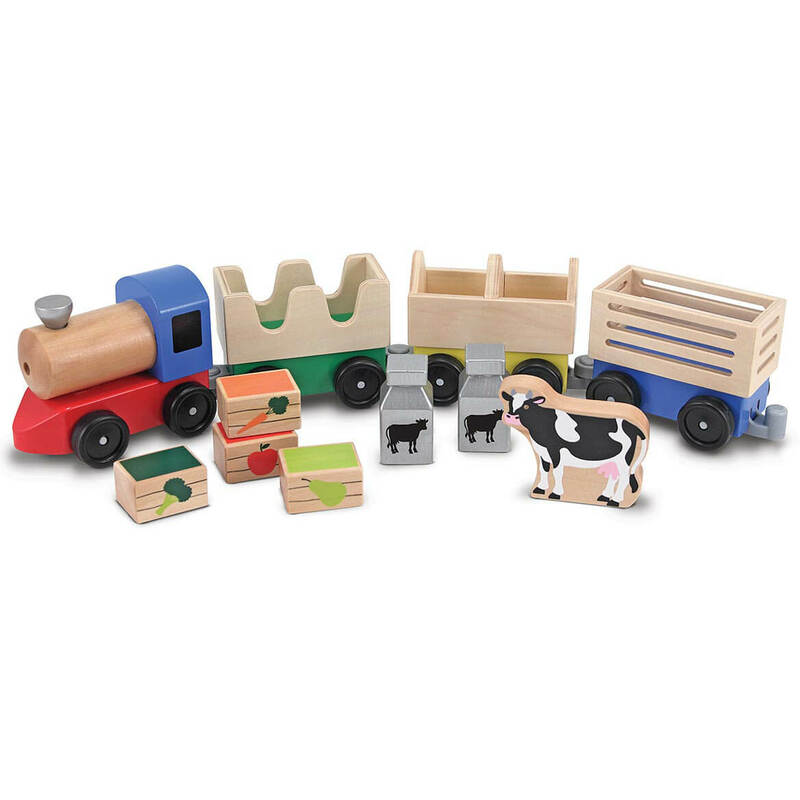 This busy Melissa & Doug® Wooden Farm Train is just what’s needed to transport a new cow or take cans of milk, fruit and vegetable crates to market. Your young engineer’s imagination will be engaged by the colorful wooden train and the three interchangeable cars. Hours of fun will be provided as your child loads and unloads the train cars and pretends to steer the train. Express shipping not available. Please allow 2-3 weeks for delivery. Prepare perfect pretend pasta every time with this 50-plus-piece Melissa & Doug® Prepare & Serve Pasta set! Fun pasta boxes hold felt penne, bow tie pasta, linguini, and ravioli pockets that can be hand-stuffed with felt spinach, meat, or cheese fillings. Follow the illustrated guide to order and “cook” the pasta in the large cook pot with lid, and “strain” it in the colander (the box doubles as a cook top and a sink!). Use the pasta spoon to scoop into the included pasta bowl, top with tomato sauce, cheese, or, butter toppings, and dig in! The set also includes a sauce jar, cheese shaker, salt shaker, and fork. 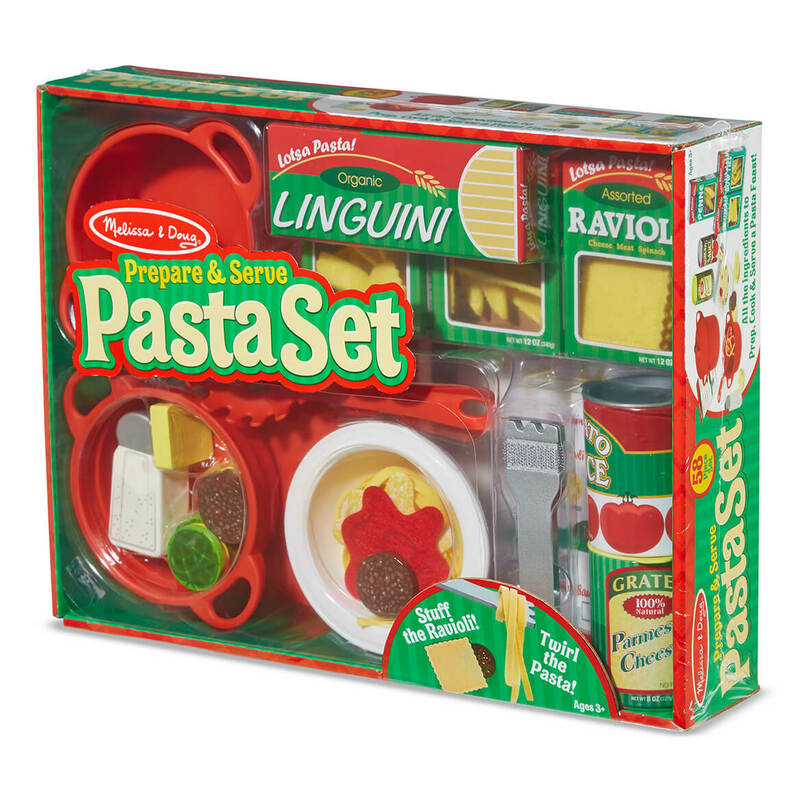 This inventive set lets kids create countless imaginative pasta meals from start to finish! Express shipping not available. Please allow 2-3 weeks for delivery. Who’s ready for breakfast? With this Melissa & Doug® Wooden Flip & Serve Pancake Set, a young chef can prepare two golden-brown pancakes with all the fixings on a cooktop surface printed on the back of the corrugated storage box! Ingredients include chocolate chips, blueberries, bananas, and pats of butter. Cook them up on the wooden skillet and use the utensils to flip and slice. Self stick tabs on the food pieces make a satisfying crunch when sliced and also help the toppings stay on the pancakes! Serve up the pancakes on the printed thick paper placemat with a festive gingham design for hours of pretend-play fun. Express shipping not available. Please allow 2-3 weeks for delivery. 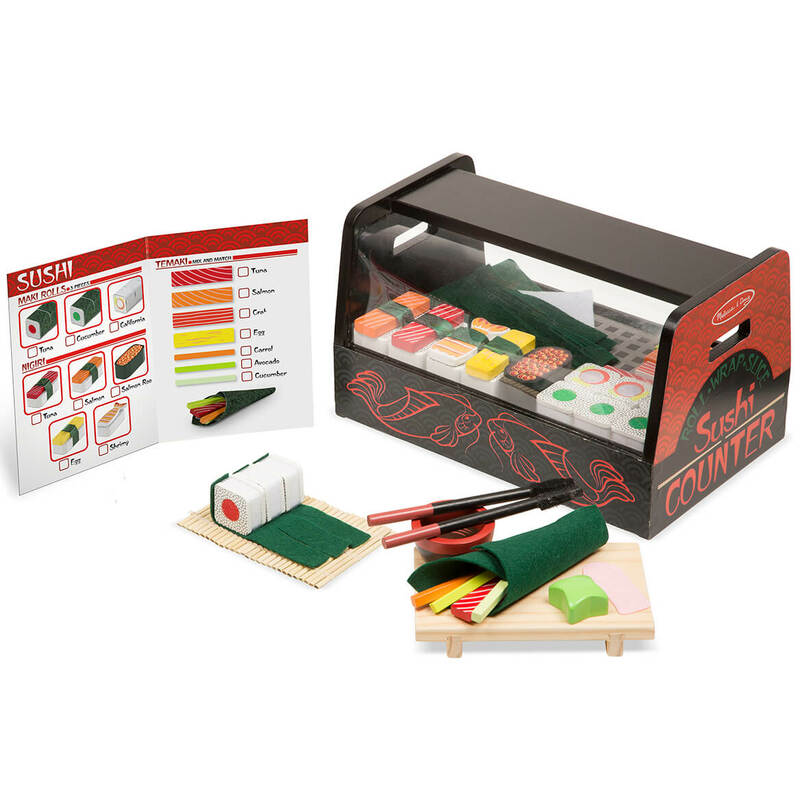 Budding young sushi chefs will be able to practice their rolling, wrapping, and slicing skills with this unique wooden Melissa & Doug® Roll, Wrap & Slice Sushi Counter play set. The 46-piece play food set includes a tabletop display/serving counter that holds all the ingredients for making maki rolls, nigiri, and temaki. Lay the wooden sushi pieces on the felt nori strips, stick them together with the self-stick tabs, roll with the sushi mat, then slice and serve with ginger, wasabi, and soy sauce! Order on the reusable menu/information/instruction card and pick up the pieces with chop sticks! Approx. 7 1/2″ long x 8 2/3″ wide x 13 1/2″ high when all together. Express shipping not available. Please allow 2-3 weeks for delivery. 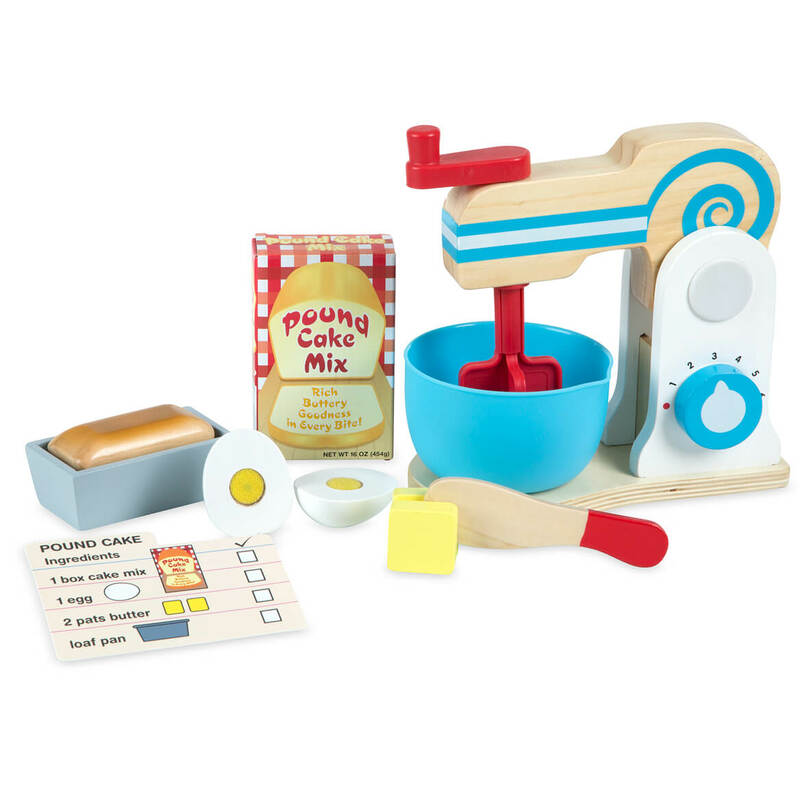 Mix up some delicious pretend-play fun with this realistic Melissa & Doug® Wooden Make A Cake Mixer Set. Turn dials to “adjust speed” and use the crank to turn the bowl that fits the mixer. Wooden ingredients include two pats of butter and a two-part egg, both of which have self stick tabs that can be sliced through with the child-friendly wooden knife. Follow the directions on the recipe card to make pound cake – the Melissa & Doug® cake set includes a pound cake mix box, pretend pound cake loaf, and a cake pan. Kids 3 and older will love cracking, slicing, blending, and serving up pretend baked treats with this kids cooking set that encourages creative thinking and imaginative play and promotes memory and number skills. Express shipping not available. Please allow 2-3 weeks for delivery. 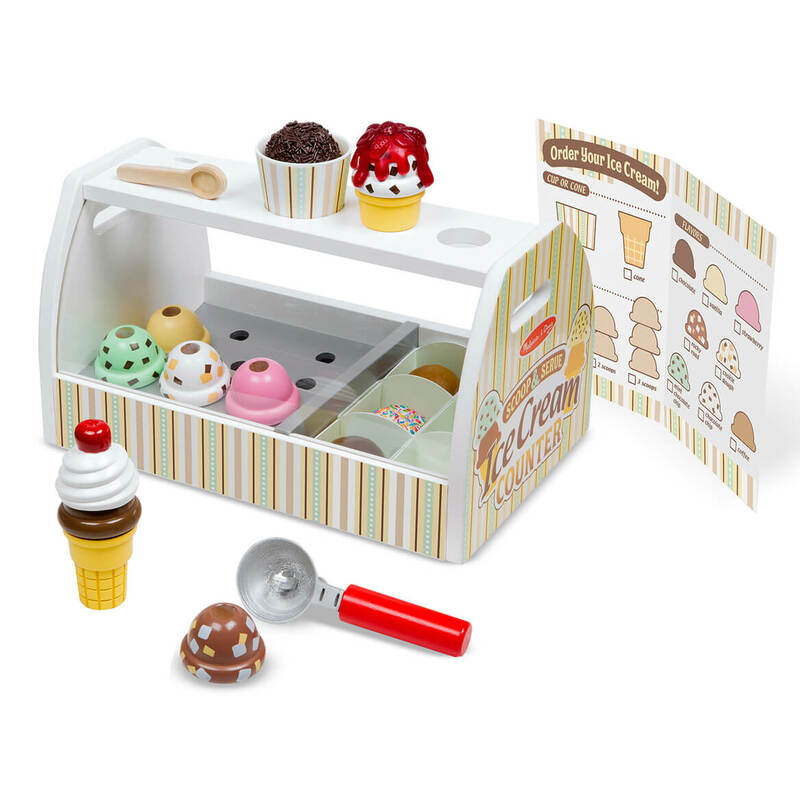 Scoop up some cool treats with this all-inclusive, 20-piece Melissa & Doug® Scoop & Serve Ice Cream Counter! The sturdy wooden tabletop counter holds 8 wooden scoops of different-flavored ice cream, 6 assorted toppings, 2 cones, a plastic cup, an ice cream scooper and a wooden spoon. The scooper fits into a hole on top of the scoops to lift, stack, and release. Take orders on the reusable menu card and serve up delicious fun! Express shipping not available. Please allow 2-3 weeks for delivery. Grill it, slice it, and turn it! 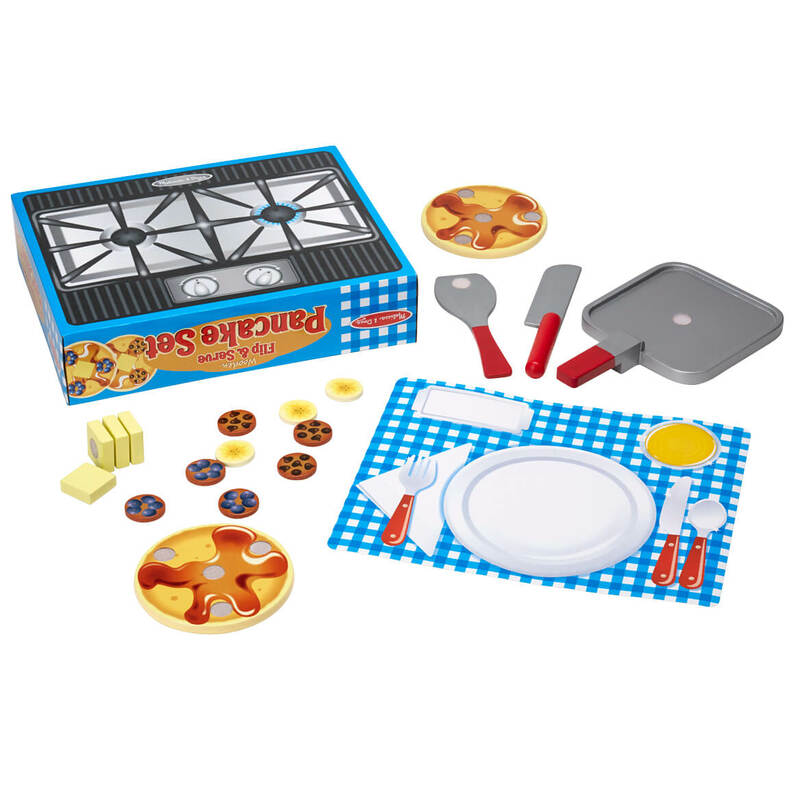 Cook up a fantastic feast with this Melissa & Doug® Wooden Rotisserie & Grill Barbeque Set! The 24-piece kid’s grill set includes specialty grilling favorites like a whole rotisserie chicken that spins on a skewer, a whole fish, sausage, shrimp, and even vegetables for grilling kabobs. Use the kid-friendly wooden basting brush, spatula, tongs, and knife to prepare, flip, grab, and cut the food. 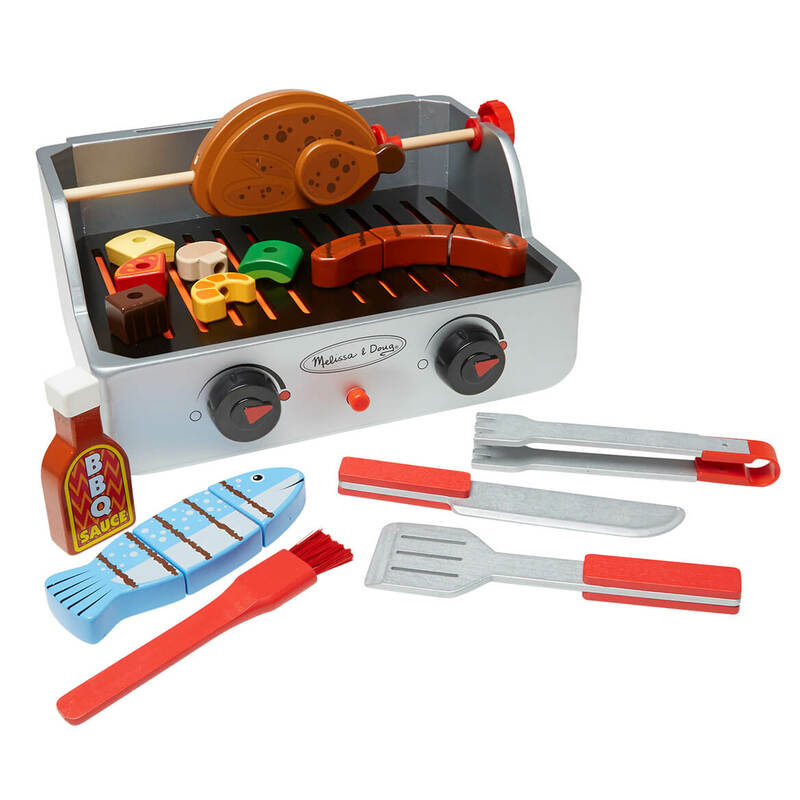 This toy BBQ is easy to “fire up” with its ignition switch; adjust the temperature with the movable knobs on the barbecue, and turn the rotisserie so the food grills to perfection! The chicken, fish, and sausage pieces are held together with self-stick tabs; use the knife to slice them apart. After mealtime, use the grill as a handy storage place for all the items! The Wooden Rotisserie & Grill Barbecue Set encourages hand-eye coordination, fine motor skills, creative expression, and imaginative play. Grill measures 15″ x 11″ x 8 1/4″. Express shipping not available. Please allow 2-3 weeks for delivery.